From my understanding, suicidal ideation comes from two paths: 1) extreme pain, and 2) depleted self worth. 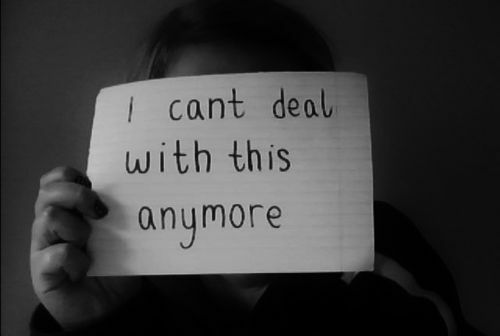 When pain becomes so extreme, suicide can seem like the only way to make the pain stop. I think this is the type of suicidal ideation that most people are familiar with. Suicide is more understandable for a person in a physically injuring situation who is fearing of future injuries. It makes more sense for that person to consider suicide as they are attempting to escape actual physical pain. The depletion of self worth and the suicidal ideation that comes along with it is much more difficult to understand. We like to think that our self worth is completely within our own control, and the idea that someone else can effect that in any significant way is difficult to comprehend. But, its true. One's self worth can regularly fluctuate and it can be directly influenced by those who surround us and how often we come in contact with these self-worth-draining people. I go into more detail about the origins of our self worth in my post Exploring Insecurity and Self Worth. Defining our value in society is not clear cut. There are such a huge plethora of different ways to bring positive value to society; many of which are incredibly difficult, if not downright impossible to quantify. We therefore have a tendency to fall back upon a few objective traits you "must have" in order to be a "worthwhile member of society." This post will focus on the dynamics of living with people, and the traits you "must have" in order to be a "worthwhile member of this household." Maintaining a house and living together is a group project. Entropy is inevitable so things need to be cleaned and repaired. People need to eat. Food and household supplies need to be purchase. Additionally, people live their lives in this space. People watch TV. They walk around. They work on projects. They listen to music. They figure out the ideal temperature for themselves. In a group of healthy people with a respect for sharing living space with each other, this isn't much of a problem. They figure out how to share household maintenance, cooking, and shopping. They figure out how to share the living spaces so everyone can peacefully enjoy their lives. They figure out how to share the temperature so everyone can be comfortable. The default appears to be to try to share everything equally: everyone does each chore in rotation; they agree how to split up and share the living spaces, and have noisy hours and quiet hours; they have a discussion about temperature management. Others do things more organically, just automatically evaluating each person's strengths and weaknesses. One person does more shopping and cooking, another person more cleaning, and while another person still may have much fewer duties because they are sick or in school or struggling with an important project at work. Generally these people are flexible and sympathetic for each other and automatically adjust around each other's needs. When someone feels overly burdened or things are unfair, they'll speak up and have a rational conversation about it. When an equilibrium cannot be found, the problems maintaining one's self worth abound. One way this can happen is when one or more people are inflexible, don't have the capacity to understand other people as unique individuals, and/or inflate their own experiences as more important than others. In this case, the inflexible person (or people) have a rigid idea of how household maintenance and living spaces should be done, and any deviation to that means you're not pulling in your fair share. Not pulling in your fair share means you are a drain on this household community. You are not giving enough to be worth the imbalance. No matter the reason why this imbalance occurred, you are, right off the bat worth less than the inflexible person dictating the rules. It's a shot against you, it's a piece of damage against your psyche and now you have to repair it. You have to take some time to repair that damage. Time that an inflexible person likely doesn't comprehend that you need. They'll just shoot you again before you've repaired the prior damage. Their expectations are impossible for even above average people to achieve. e all have our own things we need to get done to maintain our life. You don't have enough energy. Some people have an almost never ending supply of energy, and they just don't understand people who have a finite supply. To an inflexible, judgemental person, none of that matters. You did something wrong. You didn't meet their expectations. You're at fault. Something is wrong with you. You're flawed. You are worth less. Every time the judgmental person points out that you're not holding up your "fair share" of the household duties is like a slice against your self worth. Every time this happens, you need to take time to repair your self worth -- but when you're living with such an inflexible person, it is very easy for the damage to outpace the repairs. Once self worth becomes too damaged, suicidal ideation starts up. Once one's self worth has been completely depleted, death occurs. Humans are social creatures. Why exist if one cannot be a net positive to society? Another form of damage to self worth is the inability to share living spaces. It's exposing how much of a burden your existence is to another person. It is a very rare household where everyone can live their lives without disturbing another person at all. Therefore, households generally figure out how to minimize irritating each other so they can all live their lives. If there is a conflict, they gauge the harmfulness and/or helpfulness of the action between each effected person and figure out a solution. Sometimes it's limiting activities to certain times, or the effected person removing themselves during the activity, or even banning the activity because it is deemed the harmfulness greatly outweighs the helpfulness. For the inflexible person, however, especially one with difficulty grasping the experiences of others, there is no discussion. The action is wrong, their experience regarding the action is all that matters, and therefore you are at fault. You are flawed. You are worth less. Judgmental people can also have problems with just normal socializing. The same inflexibility in managing a household can often appear when socializing. They may have more likelihood to outright state what they think is wrong about you. This can be additionally harmful to your self worth because you are in frequent contact with the people you are living with. Always needing to be right, and tending to be argumentative. Doesn't allow you to contribute to the conversation. Prevents you from earning social recognition, such as by not reacting to the fact that you've said anything at all and block any one else from being able to react to your statements. To the judgmental person, you're not only worth less because you don't take on an appropriate load of the household, you're also worth less because nothing you do has any value. The judgmental person strips you of both your objective and subjective value. Unfortunately, these types of people are much less likely to actually demonstrate praise. It's all about what you do wrong. Those random receipts of praise are critical for building and healing up someone's self worth. How does self worth work? We are social creatures, so of course our self worth will be modified by those around us. When we are children, growing up and learning about the world, the definition of our self worth is directly created by the people who are around us. As we get older we learn to take on stewardship of our own self worth, but it will always have an opening to be modified by others in the outside world. Apple can't completely secure the iPhone from hacking, and we sure as hell can't completely secure our self worth from being poked and prodded by others. We experience injuries to our self worth on a regular basis. This is healthy and necessary in order to grow and become the best contributors to society as we possibly can. We make mistakes. We break things. We hurt people. We do this all the time, and we feel bad about it. This shame is a major driving force to make us all in a society work together. Our self worth gets injured, we take some time to fix it, and we take some time to figure out how to be better next time so our self worth doesn't get hurt again. Then we move on. This is a healthy and necessary part of living in society. This is how we become better people. The problem comes when the injuries to our self worth come at us faster than we are able to repair or defend it. When you're living with a particularly judgmental inflexible person these injuries can be flying at us constantly. Even when the person isn't around, the injuries can keep piling on; their words linger in our thoughts. Our self worth wears thin, and we begin to seriously question, "Why am I alive right now? I am a net drain on society. I am hurting people by being here. I am suffering from a shame attack by being here. Maybe I should just die." There are objective and subjective values people have that define their self worth. Subjective ones are impossible to quantify or measure, and can even be difficult to truly grasp and understand. Objective values are much easier -- they can be measured and counted and their values compared more easily. People have a tendency to cling to these objective values as all important and even go so far as to completely reject subjective measures of value. Society often wishes you could just withstand the barrage of damage to your self worth just to make the judgmental person feel better. But its OK if you don't. It's OK to be different. It's OK to live life a little differently. It's OK to have different needs. It is the judgmental person who is providing negative value to the world by restricting one's potential in order to fit into their rigid view of the world, not you. I'm supportive. I can quickly identify when people need support and figure out the best way to help them. I help other people to heal and grow their own self worth, enabling them to go out and create more objective value in the world. I'm helpful. I try to spread my knowledge whenever I can. I take time to explain things and teach people. I continue to learn things so I have more information to spread. I believe in Open Source and Open Documentation so anyone can access anything I learn or do and use it for themselves. This helps me to enable other people to create more objective value in the world. I'm creative. I love making things, everything. Art helps make the world a better place. These seem like small things, but I truly believe they make huge impacts. My husband is basically my care taker, but I think he's OK with it because he values so much the support, helpfulness and creativity I bring in to his life. I open a doorway to joy. To him, cooking my meals and cleaning dishes is a small thing for him to have a subjectively better life. I browse the internet and I send off these little messages here and there because maybe, somewhere, some person, even just one person, might do a little better for having read something I wrote. These small, yet powerful, values I offer are difficult to keep tangible and within my grasp of understanding. If I were to live with an overly judgmental person, it would be so easy to get flooded with reminders of how objectively worthless I am and completely forget that I can provide any value at all. It makes it so easy to get lost in the din and start to truly believe that perhaps I have no worth left and perhaps it would be better to die.